Total Revenue increased 22% yoy to $299.9M. Premier Agent Revenue increased 22% yoy to $213.7M. The number of Premier Agent accounts, including accounts of brokerages and other teams, spending more than $5,000 per month grew by 58% year-over-year in both total number and on a total dollar basis. Total sales to Premier Agents, including brokerages and other teams, who have been customers for more than one year increased 38% yoy. New sales to existing Premier Agents, including brokerages and other teams, or those that were paying advertisers at the beginning of the quarter, accounted for 70% of total bookings. Rentals Revenue increased 35% to $29.1M. Mortgages Revenue decreased 6% yoy to $19.0M. Other Revenue increased 33% yoy to $38.1M. GAAP net loss was $18.6M, or (6)% of Revenue. Adjusted EBITDA was $46.3M, or 15% of Revenue. More than 175M average monthly unique users accessed Zillow Group brands’ mobile apps and websites during 1Q18, an increase of 5% yoy. 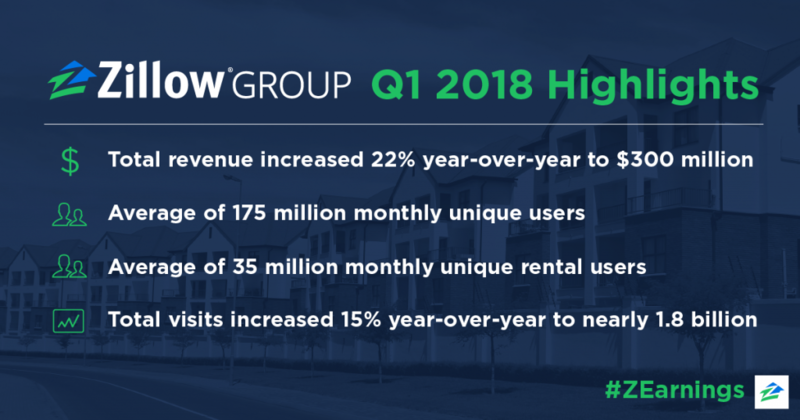 Visits to Zillow Group brands’ mobile apps and websites Zillow, Trulia, StreetEasy (included as of March 2017) and RealEstate.com (included as of June 2017) increased 15% yoy to nearly 1.8B during 1Q18. Premier Agent revenue per visit increased 6% yoy during 1Q18. Announced plans to participate in the Zillow Instant Offers™ marketplace by buying and selling homes with Premier Agent® partners in the Phoenix and Las Vegas markets. Launched the test of a new lead validation and distribution process that adds efficiency to the Premier Agent® marketplace. In the second quarter of 2018, Zillow Group expects to begin reporting financial results for its two reportable segments: the Internet, Media & Technology (“IMT”) segment and the Homes segment. The IMT segment will include the financial results for the Premier Agent, Rentals, Mortgages and new construction marketplaces, dotloop, and display, as well as revenue from the sale of various other marketing and business products and services to real estate professionals. The Homes segment will include the financial results from Zillow Group’s buying and selling of homes directly through the Zillow Instant Offers marketplace, which Zillow Group announced in April 2018. In addition to presenting Zillow Group’s consolidated outlook that was provided on the April 12th investor update call, the company also provided the second quarter and full-year outlook for each segment in the earnings press release, which can be viewed on the Investor Relations website at: http://investors.zillowgroup.com/releases.cfm. This communication contains forward-looking statements within the meaning of Section 27A of the Securities Act of 1933 and Section 21E of the Securities Exchange Act of 1934 that involve risks and uncertainties, including, without limitation, statements regarding our business outlook and future operational plans. Statements containing words such as “may,” “believe,” “anticipate,” “expect,” “intend,” “plan,” “project,” “will,” “projections,” “continue,” “business outlook,” “forecast,” “estimate,” “outlook,” “guidance,” or similar expressions constitute forward-looking statements. Actual results may differ materially. For information about potential factors that may affect Zillow Group’s business and financial results, please review the “Risk Factors” described in Zillow Group, Inc.’s Annual Report on Form 10-K for the year ended December 31, 2017 filed with the Securities and Exchange Commission, or SEC, and in Zillow Group’s other filings with the SEC. Except as may be required by law, Zillow Group does not intend, and undertakes no duty, to update this information to reflect future events or circumstances. 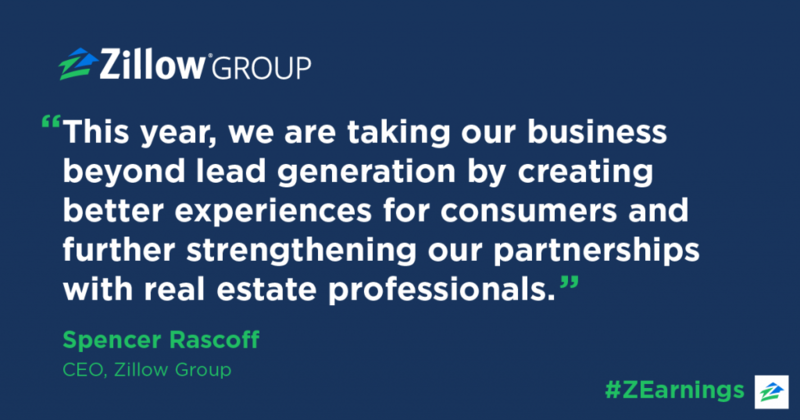 Zillow Group urges you to review its earnings press release as it contains important information about the company’s financial results, including reconciliation tables and related information about this non-GAAP financial measure. The earning press release is available on the Investor Relations section of the Zillow Group website at http://investors.zillowgroup.com/releases.cfm. It is also included as Exhibit 99.1 to the Current Report on Form 8-K as furnished to the SEC on May 7, 2018, which is available on the Investor Relations section of the Zillow Group website at http://investors.zillowgroup.com/sec.cfm and the SEC’s website at www.sec.gov. Other Revenue primarily includes revenue generated by new construction and display, as well as revenue from the sale of various other marketing and business products and services to real estate professionals. Zillow Group internal data. Includes Zillow, Trulia, HotPads and StreetEasy.